Twenty-four victories, eight losses and 21 draws; Pakistan’s head to head Test match record against New Zealand is nothing short of enviable. It is Pakistan’s best record against any Test playing opposition, excluding Bangladesh and Zimbabwe, and is testament to the unsurprising fact that the men in green have not lost a Test series on New Zealand soil since 1985. As a result of 12 consecutive unbeaten Test series in New Zealand, the land of the long white cloud is Pakistan’s happiest hunting ground outside of Asia. However, while history and numbers dominantly favour Pakistan, the upcoming two Test series in New Zealand, which kicks off tomorrow in Christchurch, is likely to be evenly contested and hard-fought. Team Pakistan has been on the rise ever since Misbahul Haq took over the reins of captaincy in 2010, moulding a wounded unit (post-spot fixing scandal) into world beaters, over the course of six years and 49 Test matches. 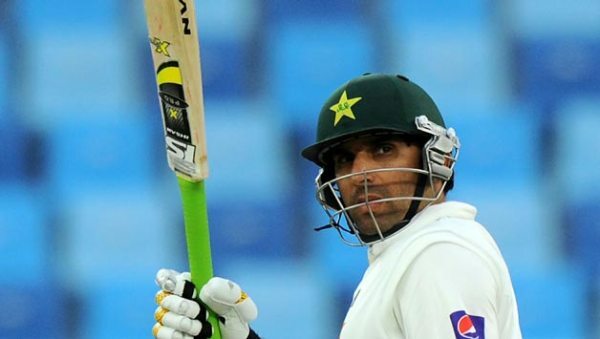 Arguably the calmest head in Pakistan cricket history, Misbah is on the cusp of another major milestone in his career; leading Pakistan in his 50th Test as captain. He has marshalled his troops in New Zealand once before, in the early days of his captaincy, back in 2011. 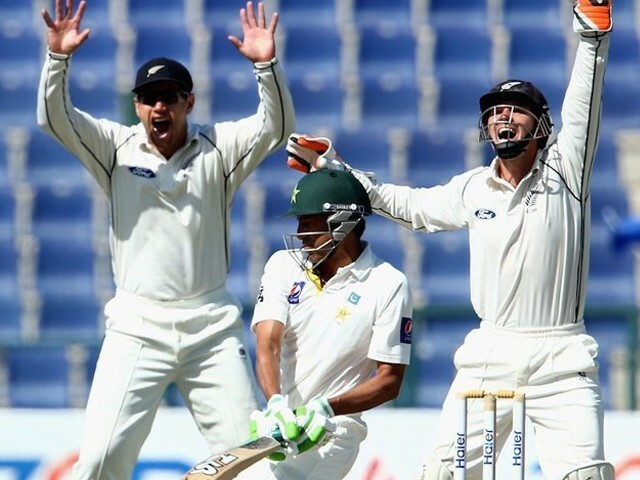 Pakistan won that series 1-0, albeit against a much weaker New Zealand eleven. Misbahul Haq’s captaincy records are better than the combined records of captains in the six preceeding years. This time is different though, with the Black Caps boasting a young, energetic and dynamic unit, with the likes of a mature leader in Kane Williamson, an exciting all-rounder in James Neesham and a formidable seam bowling partnership in Tim Southee and Trent Boult. That said, the Kiwis will deeply miss their recently retired former captain, the charismatic and hard-hitting superstar, Brendon McCullum. 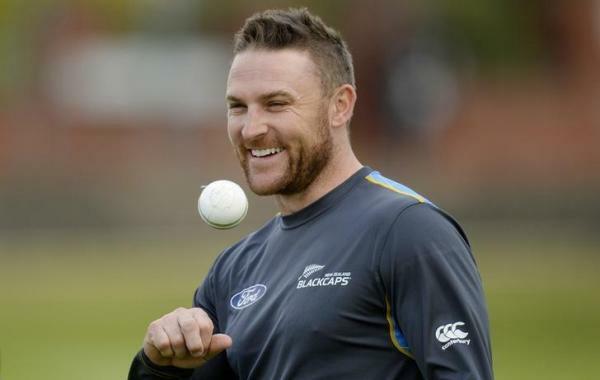 McCullum was influential in leading New Zealand against Pakistan in the UAE in 2014, a series which was tied 1-1 as New Zealand came from behind in the third Test, thrashing Pakistan by an innings and 80 runs in Sharjah. McCullum and Williamson were the main protagonists in that Test match, with scores of 202 and 192 respectively. New Zealand’s Brendon McCullum during netsAction. Team Pakistan will be wary of the challenge imposed by the Kiwis and remain favourites to win the series, ever so slightly, with form and experience on their side. Misbah is Pakistan’s most successful Test captain for a reason. Being the epitome of hard work, toil and discipline, he has infused these very qualities within the team, leaving no room for complacency. 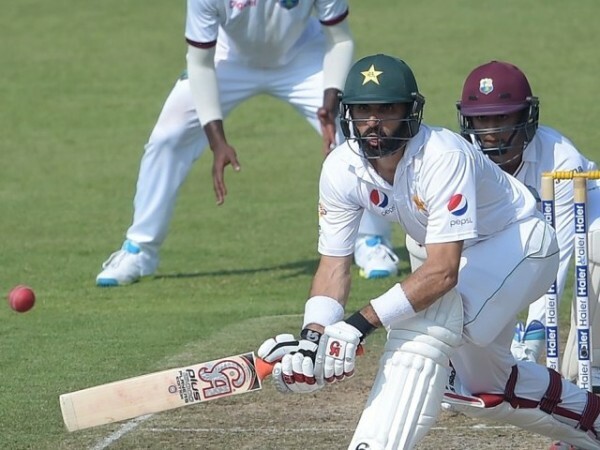 The team will be aching after a shock defeat to West Indies in the recently concluded Test series in the UAE, and will be itching to get back on the field and perform, in a bid to regain the number one Test team rank from arch-rivals India. Misbahul Haq plays a shot at the Sharjah Cricket Stadium on October 30, 2016. Beating this New Zealand team in their backyard will by no means be a walk in the park, in seam friendly conditions which are fundamentally alien to Asian batsmen. Given the fact that Pakistan’s only warm-up game in Nelson was washed out, it will be interesting to see how the team starts the tour tomorrow in Christchurch. The men in green will bank on their experienced batting line-up, comprising of Misbah, Younus Khan, Azhar Ali and Asad Shafiq, all of whom have played Test cricket in New Zealand before. 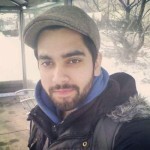 The pressure will certainly be on the bowling unit, the pace attack in particular, as the likes of Mohammad Amir and Wahab Riaz will be expected to extract significant movement from the pitch and make the ball talk. 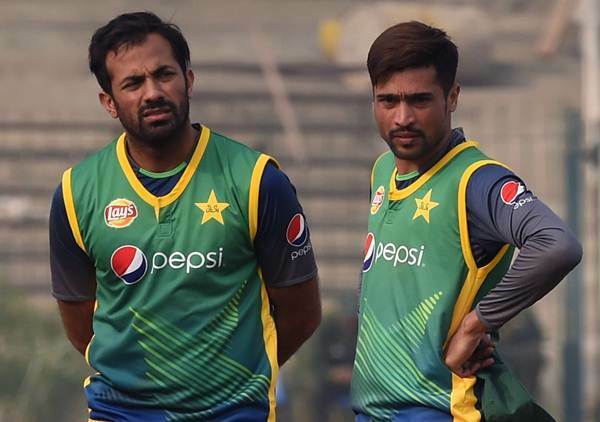 Pakistani cricketers Wahab Riaz and Mohammad Amir take part in a team practice session. As for team selection, Babar Azam is expected to replace Mohammad Nawaz in the playing eleven, in order to strengthen the batting unit. Another, rather unlikely, possibility would be to give Sharjeel Khan his Test debut, shifting Azhar back to his preferred number three position. The tough call, however, will largely revolve around picking the third seamer, to partner Amir and Wahab. Of the three contenders, Sohail Khan appears to be the most likely selection, as his right-arm fast bowling adds variety to a prevailing left-arm pace attack. Sohail has had a decent return to Test cricket, with a string of impressive performances including two five-wicket hauls against England. However, Rahat Ali could be a surprise selection, as Misbah has not been afraid to field three left-arm pacers in the past. Rahat was an integral part of the team which faced New Zealand in the UAE two years ago, and has remained a seasoned professional during Misbah’s tenure as captain. 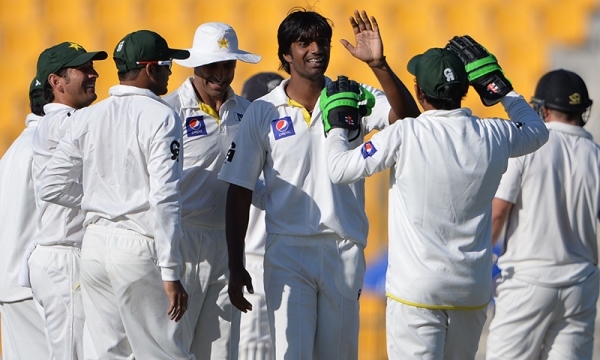 Rahat Ali celebrates with teammates after taking a wicket. Ahead of the first Test, Misbah highlighted the inexperience at the top of the New Zealand batting order, with opener Jeet Raval set to make his Test debut, replacing Martin Guptill. The skipper also shed light on the confidence gained from the successful tour of England earlier in the year, and remained confident that the experience gained from that series would aid his batting unit in adjusting to varying conditions. Similarly, Kiwi skipper Kane Williamson was confident that his team had the potential to bounce back in to form, after being mutilated at the hands of South Africa and India. In the recent past, we have seen South Africa lose a home series to England after losing away to India, and Australia losing to South Africa at home after getting whitewashed away to Sri Lanka. New Zealand will be keen on breaking this trend, having had an impressive home record over the past three years, winning seven out of 11 Tests, losing only two. The Christchurch Test will be a four-day affair (98 overs per day), due to the first day being washed out entirely. Both teams are raring to go at each other, as Pakistan will be hoping to defuse New Zealand’s attack-minded approach and gain some much needed winning momentum ahead of the all-important tour of Australia. The cricket world has its eyes keenly set on Misbah, who has the opportunity to forge his legacy in the golden pages of the history books, by becoming the first Pakistani captain to win a series Down Under. we are paying these players millions of tax-payer money every year….not to take a walk in the park but to prove themselves worthy of the investment the nation is making into them.